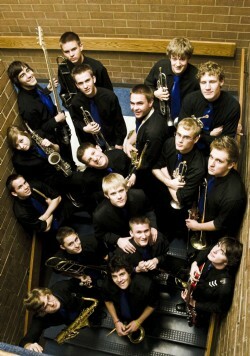 The Jazz Big Band is an advanced level jazz ensemble. This course provides opportunities to foster and refine musical expression through instrumental performance, analytical/evaluative skills, and aesthetic judgment. Study includes the care and cultivation of a beautiful tone, the ability to read music with fluency, the polishing of performance skills, esprit de corps, and responsible rehearsal habits. Students will have opportunities to experience the spontaneity of improvisation and the creative process of composing. Students will hone listening skills and their ability to analyze and critique music and music performances. Attention will also be given to relating their music experiences to the time and culture of the pieces they study, as well as to contemporary society. Membership is by audition according to ability and limited instrumentation, and concurrent membership in one of the core departmental groups is required. Core classes include, Wind Symphony, Symphonic Band, or either of the Percussion Ensembles. Members are also required to participate in a weekly sectional with their sections. The Jazz Big Band consists of mainly seniors and juniors, although some sophomores are admitted if their audition warrants it. Players will primarily be taken from the intermediate jazz ensemble at BHS, Jazz Ensemble II, with occasional spots filled from other members of the concert bands as needed. The Band performs music of a more contemporary nature focusing on Jazz, Funk, Fusion and Rock music. The Band performs at various concerts including the Fall Evening of Jazz & Percussion, Spring Dinner Dance and several Jazz festivals throughout the state including Region and State festivals. A select number of advanced members can participate in district and state Jazz Honor Ensembles. Members should plan on a performance at the Peaks Jazz Festival in Utah County every year. This is the entry-level jazz band and is open to any student who wants to perform in the jazz styles of swing, funk, and Latin A simple audition / interview is required, but no musicians are turned away from this feeder ensemble. The band performs at the Fall Evening of Jazz & Percussion, state and regional festivals, Spring Jazz Dinner Dance, and at various other school functions. Prerequisite is enrollment in a core instrumental concert group. Core classes include, Wind Symphony, Symphonic Band, or Percussion Ensemble. Private study is highly recommended.